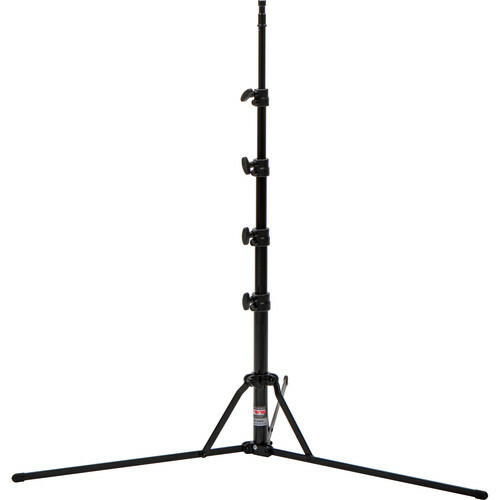 The Matthews MERF Mini Extendable Reverse Stand is a small, robust light stand with reverse folding legs. Although it folds down to 20" (51 cm), the MERF opens up to 7.4' (227 cm) and will hold up to 9 lbs (4 kg), with strength and stability that comes from the use of heavy wall, lightweight aluminum tubing. Box Dimensions (LxWxH) 19.8 x 3.8 x 3.2"
MERF Mini Extendable Reverse Stand is rated 4.5 out of 5 by 30. Rated 2 out of 5 by MediaOnQ from Excellent Brand Not So Great Item I want to point out that I own and have used Matthews gear and feel that they are a great company the designs solid tools for filmmakers. With that out of the way, I could not recommend this particular light stand for a couple of reasons. The knobs that tighten and loosen the stand are a bit fragile or maybe I just think of them as fragile because they appear to be made out of some kind of plastic. Extending the legs as well as closing them was not fluid but rather felt like I was fighting the light stand. While I would guess that for some this is a great piece of kit, for me the feel and ease of use while on location during a shoot did not perform well enough to remain a part of my kit. Rated 5 out of 5 by Joshua V. from Stronger & taller than nano, made in USA I have a handful of the Manfrotto Nanos, and they've been fine (although wobbly, rickety, occasionally too weak for the task at hand, and made in China). I was ready to add one more to the stable, and decided to look at cheaper alternatives, since all the knock-offs have been about the same (wobbly, rickety... ...made in China). I ended up paying a few dollars more for the MERF, but it's money well spent. The MERF is taller, made with lock-nuts and bolts instead of rivets, has a higher weight capacity and is all around better material, for just a few extra bucks. Also made in USA, which, yes, does matter. Rated 5 out of 5 by Daniel from Step up from Nano I have 2 Nano stands which are good, but the MERF definitely seems studier. The MERF is almost the same size as the Nano when collapsed & doesn't feel that much heavier (even though it is a bit heavier). I use the stand with umbrella and SB-910's or a quantum when I can't lug around the heavy duty stands. Whole set up seems pretty sturdy, but I would definitely add a sand bag (or other weight) towards the base for extra stability. I put orange gaffer type tape along the legs to increase the visibility since they can easily get stepped on at events. Not sure if I will even use my nano stands anymore since getting the MERF... The merfs are that much better. Rated 5 out of 5 by mindlessbuttonmasher from A Good Design Made Better The quick release tabs are far quicker and easier (also smooth) than those on the Monfrotto or Dynalite stands which are very similar designs. I own a Dynalite stand like this, which I believe is made by Monfrotto since it's exactly the same only more expensive. I wanted a second and found this one. It's the same size closed, has a fatter middle tube simply because it extends higher, has screws and nuts in legs rather than rivets, and has far superior quick release levers to raise it up and down. Excellent product as are all Matthews gear. I'm getting a second one. Rated 5 out of 5 by Anonymous from strong and tall enough .....the Matthews MERF mini stand is what you would expect from Matthews. In my 16mm film days I used many of their products. Nothing has changed with their quality. If you are looking to reduce the size and weight of your lighting kit check out this stand. You can make virtually any repair needed to this stand as there are no rivets to drill out. And, the friction clamps give a very firm grip and are much quicker to use. With newer and lighter battery rigs, I have now reduced my lighting kit to a light weight carry on that would not be possible without these stands. Go git 'em. Rated 2 out of 5 by David from Poor Execution of a Good Idea I bought this stand because it is super small when folded down making it easy to travel with. Nothing else I found gets this small and I like the fast locking feature on the legs as well. Unfortunately the legs are very thin and poorly attached making it very flimsy when it's set up. It's also a little time consuming (as light stands go) to set up as the leg mechanism doesn't slide well when you open it. Additionally, it's pretty expensive compared to other similar fully extended sized stands. Not a good value unless you absolutely need a stand that is super small when it's folded down. Rated 5 out of 5 by Nadine from Best little stand ever! Super compact when folded up, has like a backward fold so it is much more compact that you would think, but stands up really tall. Very light weight and easy to use. I have had tripod stands that kill your fingers trying to unlock and extend them or pinch your fingers trying to fold. This is great. Also, leg supports are very sturdy. Some tripod leg supports bend when you're folding it up. These do not. Very strong. Also constructed with bolts rather than widgets in case any supports need replacing, not that I foresee that as an issue, but nice construction. Rated 5 out of 5 by David H. from Great Portability, Solid Construction These stands made it possible for me to fly alone with a complete camera and lighting kit. They pack down to 20 and are lightweight with a clamp locking system. Set up time is quick, and for the size the construction is surprisingly solid. I used one with an Arrilite 750 Plus which was pushing it, but had no problems. The benefit with these is the portability and quick set up time. They are pricey and don't have a large weight capacity, but the ability fly with a small light kit with the stands is well worth it. So if you're transporting your gear alone these MERF minis are the way to go. Is there anyway to remove/reverse the stud? I'd like to mount a light that uses a female thread (so I'm hoping that you can reverse the stud to reveal a male thread)? How does this stand compare to the Matthews Reverse stand? I can see the MERF packs smaller, and the Reverse Stand holds a little more weight. Neither of those issues are deciding factors for me. Are there any other differences? I'm curious why people picked one over the other? I'm leaning towards getting the MERF because their max weights are so similar, but with the wider base it seems like the Reverse Stand should have more advantage than what the spec shows. The MERF is about 3 shorter when folded, and when unfolded can get about 3 lower to the ground. They extend to almost the exact same height. They're also the same diameter when folded. I personally prefer the reverse stand, because its footprint is a little bigger, and it has fewer knobs. I would only get the MERF if I absolutely needed it to be shorter when packed. What is the difference between this Matthews MERF Mini Extendable Reverse Stand and the Matthews Reverse Stand? The photos show this one with the legs flat on the the ground. The photos for the regular Reverse Stand show legs that lift the support post off the ground. Is that the key difference? They both fold the same Merf is smaller than the other. What is the actual footprint (circumfrence). of this light stand??? What is the actuall height of the stand? Specs say 2.7m, but when covert inch to m, it only around 2.2m? Will this hold the alien bee 400?